These cream cheese sugar cookies add a rich touch to this extra virgin olive oil based sugar cookie. 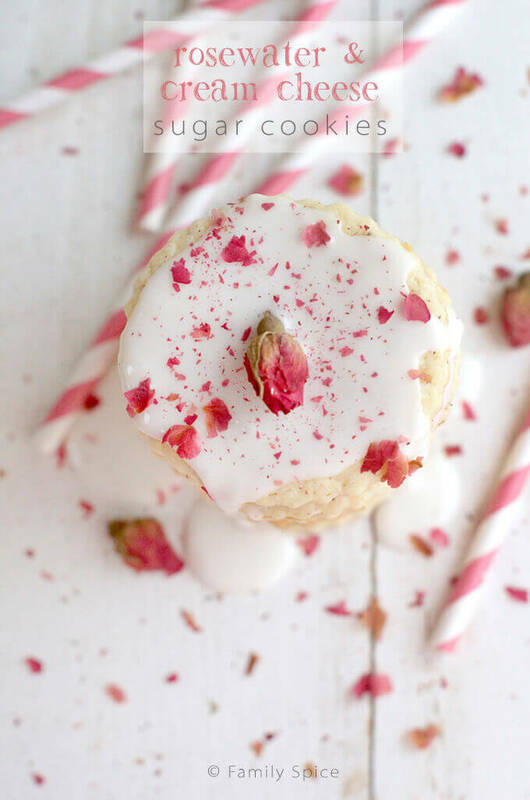 Accented with rosewater and dried rose petals, and you have a truly unique and gorgeous cookie. Are you decorating cookies in the next few weeks? My kids and I still love baking and decorating cookies for the holidays. It was a tradition we started when they were old enough to drizzle icing over cookies, and make a mess, and lick their fingers… But even now, my giant teenager still likes to get down and dirty and decorate cookies. Everyone has their personal favorite cookies to decorate. Last year it was my olive oil gingerbread cookies. Previous years we have enjoyed making and decorating chocolate roll-out cookies. Of course, my tried-and-true butter based sugar cookies were added in the mix. Because, when it comes down to it, everyone loves the classic sugar cookie. My butter-based cookie, though, has been pushed aside for my new favorite sugar cookie, my extra virgin olive oil sugar cookie that I developed for my cookbook. So, of course, I had to add ANOTHER sugar cookie option to cookie family – these rosewater and cream cheese sugar cookies. Cream Cheese adds a rich touch to the cookies, and yes, I still add a bit of olive oil to it as well. This dough works great right after mixing – no refrigeration required. That’s one thing I love about my olive oil cookie dough recipes. I am super impatient and I hate waiting for those butter cookie doughs to harden in the refrigerator. Mix, knead, roll, cut and bake. Bam! 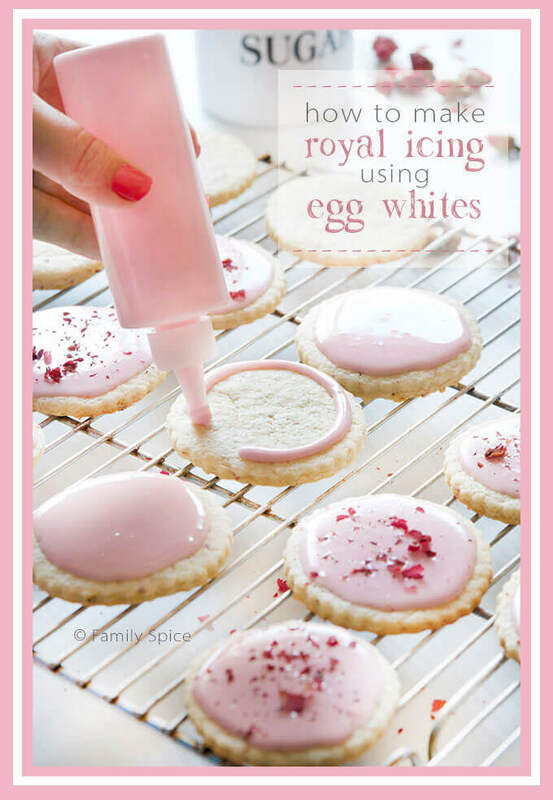 I first introduced these cookies last year, when I showed you how to make royal icing safely using pasteurized egg whites instead of meringue powder. I have modified and baked this recipe and made them without the rosewater and rose petals, too. 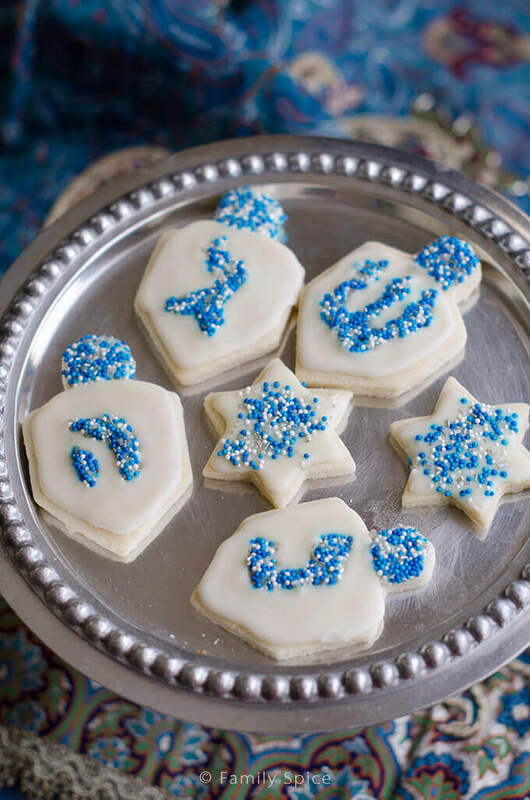 I added a bit more vanilla for these cute Chanukkah cookies. 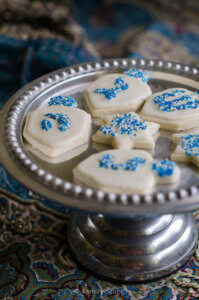 Whether you make it with rosewater or vanilla, these cream cheese sugar cookies are one fabulous and delicious cookie. So, whether you need a sugar cookie for Christmas, Chanukkah, Valentine’s Day, a birthday or whatever special occasion you can think of, I hope you give these Rosewater and Cream Cheese Sugar Cookies a try! 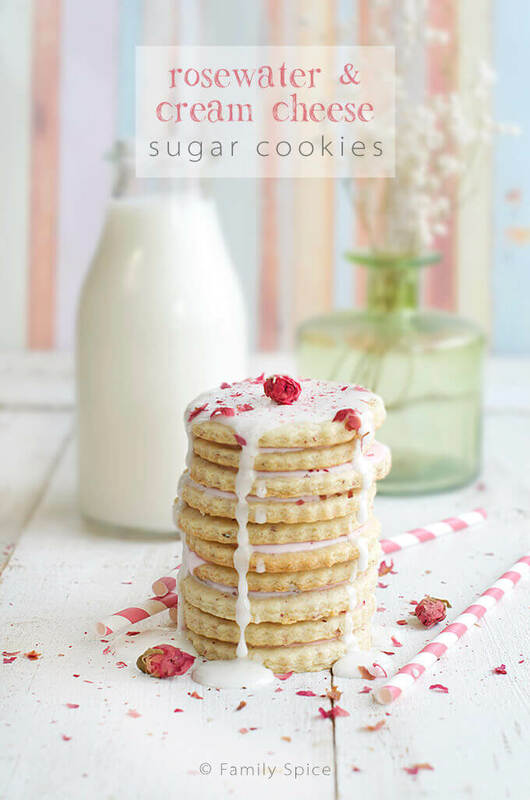 These cream cheese sugar cookies add richness, while rosewater and rose petals give a touch of exotic to this extra virgin olive oil based sugar cookie. Preheat oven to 350oF. Line a baking sheet with parchment paper or use a silicone baking mat. Whisk the flour mixture into the cream cheese mixture until incorporated. Transfer cookie dough to a clean work surface and knead by hand for 5 minutes until smooth, and form a ball. Divide dough in half, set aside, and cover one half with a clean towel. Flatten other half of the dough to a disk, and roll out between two sheets of parchment paper until 1/4-inch thick. Cut cookies with a 4-inch circle cookie cutter or other shape. Using a thin off-set spatula, transfer cookie shapes onto prepared baking sheet. If dough is too sticky, dip spatula into flour first. Bake for 10-12 minutes until lightly golden. Do not brown or cookies will be too hard. Olive Oil sugar cookies do not brown light their butter counterparts. Allow cookies to rest on the baking sheet for 2 minutes. Then, using a spatula, transfer to a cooling rack to cool thoroughly. Serve cookies as is, or frost with Royal Icing. Cookies soften over time. Store in an airtight container or resealable plastic bag. I have to wonder whether anyone ever actually made these cookies before posting this recipe. First, when you mix cream cheese and sugar and a bit of olive oil, you get kind of a thick paste. How can you possibly “whisk” a flour mix into that? It’s a gloppy mess and a whisk just ends up with a messy lump within the wires. And whisking in a beaten egg into cookie dough? Impossible. Second, “3 tsp rosewater”? Really? Anyone else here notice that “3 tsp” is the same as “1 T”? Folks who’ve cooked for years don’t make mistakes like this in their recipes. I actually made these. The flavor was OK; the texture was somewhat leaden. My wife, who’s usually pretty positive about my baking, said “I don’t think that these are worth repeating.” The only ones that were any good were the ones on which I put crushed pistachios, anchored in place by a thin reduced orange-juice glaze. Sigh. 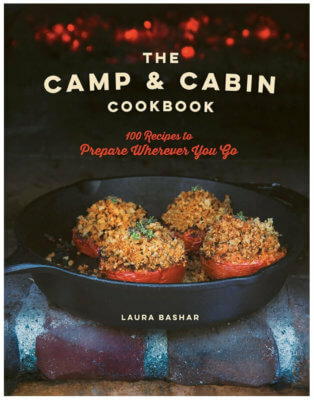 I’m sorry this recipe didn’t turn out for you. I have made it many times and never had problems with the dough, flavor or texture. I have had other no-fail baking recipes work every time except once. Who knows what went wrong. Chalk it up to joys of baking.